Supporters of Kyrgyzstan's ousted president have stormed regional government buildings in the south of the ex-Soviet republic. Hundreds of Kurmanbek Bakiyev's supporters took over buildings in Osh and Jalalabad, but the new government said it had regained control in Batken. Reports suggested airports in Osh and Jalalabad had also been disrupted. 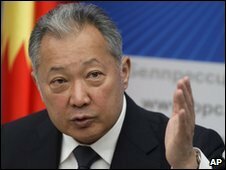 Allies of Mr Bakiyev said they had 25,000 supporters in the south, ready to march on Bishkek. The president was overthrown last month in an uprising that left at least 85 people dead. The provisional government has launched several criminal proceedings against the former president, who is now in Belarus with his family. But tensions remain high nationwide, as the government attempts to assert its authority on the country. This is the biggest challenge so far for the provisional government, reports BBC Central Asia correspondent Rayhan Demytrie. Last week there were reports that leaflets had been distributed in southern Kyrgyzstan calling for the formation of a "southern Kyrgyz democratic republic". The interim government said it was in control of the situation and had sent its defence minister to help restore order. In another development, all diplomats from the Belarussian embassy in the Kyrgyz capital Bishkek were recalled because of security concerns. The move followed a number of small demonstrations in front of the embassy in which people demanded the extradition Mr Bakiyev. 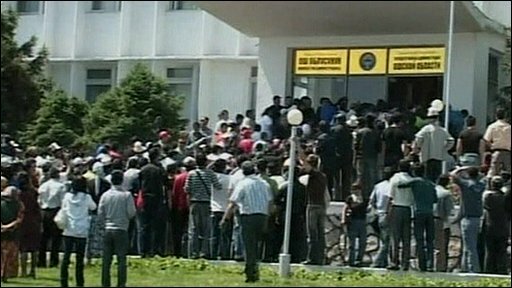 The government buildings in Osh were stormed by some 250 Bakiyev supporters on Thursday morning. They scuffled briefly with supporters of the new government before smashing their way through the glass doors and entering the building, but the police did not intervene. Sacked regional governor Mamsadyk Bakirov was said to be among the protesters, who were demanding his reinstatement. Reports from Jalalabad - Mr Bakiyev's home city - said around 100 of the ousted president's supporters had broken into and occupied local government buildings there. Jalalabad's new governor was seized by the crowd. He had gone to the scene in the hope of talking to them but was then "put in a car and taken away" to an unknown location, an unnamed official told AFP news agency. Reports say the protesters in Jalalabad were mainly women and security forces were taking care not to interfere. They chanted "Bakiyev - our president" and hung a banner reading "Bakiyev, the legal president of Kyrgyzstan" on the administrative building. Batken's administrative building was also seized but the provisional government later said it had retaken control of the situation in the city while "work [was] under way on Osh and Jalalabad". On Wednesday, a protest was held in the capital Bishkek in which supporters of the city's former mayor demanded his return. A body calling itself the "committee in defence of ousted Kyrgyz President Kurmanbek Bakiyev" told reporters that 25,000 people in the south were ready to march on Bishkek and "deal with the provisional government". Its press service was quoted by Russia's Interfax news agency as saying that they were "ready to gather in Jalalabad" for the march north.